You can use the SEARCH button on the left to explore our website for the tartan ribbon you're looking for but for a much more comprehensive search of all tartans, why not visit the web's most advanced tartan search facility? 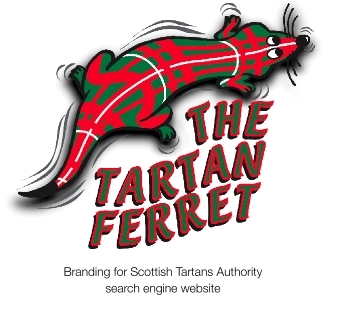 The Tartan Ferret will guide you through the International Tartan Index - an important and invaluable resource maintained by the Scottish Tartans Authority. You can search by entering your surname, clan, tartan, category (eg American military); you can search alphabetically or even by entering your favourite colours and the little furry friend will guide you through thousands of registered, authentic tartans to what you're searching for. It's also a fantastic way of uncovering rare and historic variants of the tartan which you probably did't even know existed. Please remember that of the 5,500+ tartans now registered with the Scottish Tartans Authority, only 40-or-so are produced in ribbon. The Tartan Search facility helps you find tartan, not tartan ribbon, but it's a fantastic tool for helping find which tartan ribbon is the closest to the tartan you're looking for. In most cases the same basic tartan colours will appear over and over, alowing you to compare the actual tartan to the smaller range of tartan ribbon available and find one which is similar enough to use.